We look forward to the future and often wish we could travel in time to experience it. Now visitors of the ACME Lab at the Utah Museum of Fine Arts can. Epicenter’s “Our Futures” installation allows visitors to travel into the future and experience Green River in the year 2039 through an interactive exhibit. Visitors follow two of 961 Green River citizens, Mia and Cera, through four possible and different futuristic outcomes. Visitors are encouraged to walk through the room to experience increased tourism, disincorporation, Mars colonization testing industry recruitment and recycling industry recruitment. Guests are then encouraged to vote for a single future. Not only do visitors have a chance to walk around the future, but they can read all material in English and Spanish. The best part of Epicenter’s “Our Futures” exhibit is the promotion of exploration and forward thinking. Visitors can see what the future holds for Mia and Cera while the two are encouraged to adjust their lives for their desired future. An exhibit which motivates visitors to make a positive change for the future is an exhibit I can stand by. All features of the installation educate visitors with hands-on participation. It does a great job of promoting exploration by stimulating the senses. Each of the four outcomes has a listening display where visitors can hear various sounds. Through the headphones, guests hear voices and machinery, but with so many sounds you are bound to hear something new each time. Not only can you hear each future outcome, but you can smell a part of each one. I can’t say all the smells were pleasant, but the ability to use sound and scent immerses you in the exhibit and supports active visitor participation. An exhibit which discourages any visitor involvement can be boring, especially for young children. 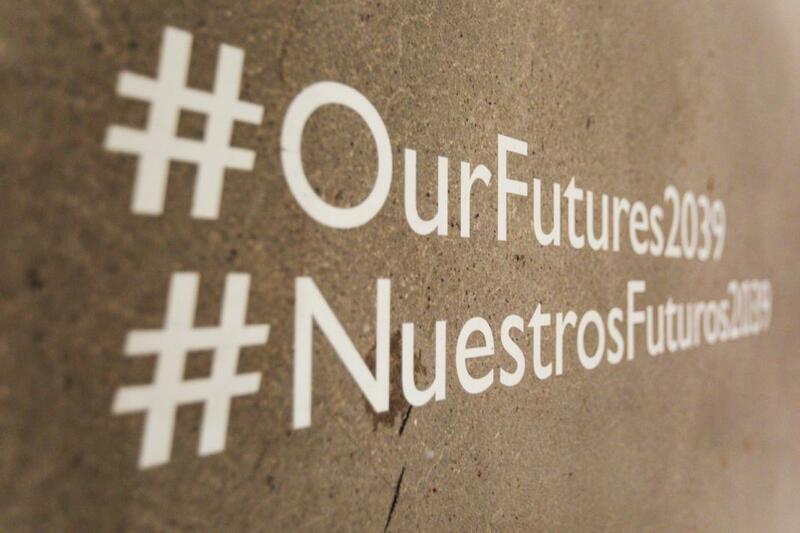 You don’t have to worry about that with “Our Futures” where each visitor is invited to participate. Not only does the installation encourage participation, but it encourages visualizing the future. The artists did a great job of inviting each individual to take a closer look at notes, costumes and equipment which contribute to each future outcome. The “For Sale” and “No Trespassing” signs seem like they are taken right out of the future and placed in the exhibit, which contributed to the futuristic feel of the area. Visitors get to explore, experience and participate in Epicenter’s “Our Futures” exhibit, which is truly worth the visit. While the exhibit may be most exciting for younger individuals, it proves to be interesting for all ages. The exploration will be well worth the trip for everyone. Before you leave, make sure you place a marble in which of the four outcomes you prefer and take one of the three pins available to show you voted for the future. UMFA is located in the Marcia and John Price Museum Building on the University of Utah campus in Salt Lake City, Utah. Epicenter’s “Our Futures” exhibit is open until July 1.